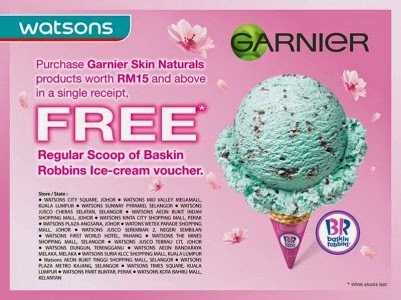 Get a free Baskin Robbins ice-cream voucher when you purchase Garnier Skin Naturals Product worth RM15 and above in a single receipt at selected Watsons stores. This promotion is valid for selected Watsons stores in Malaysia. Terms and conditions apply, available while stock last.